Our state-of-the-art concrete mixers carry all of the raw materials required to blend a wide range of concrete mixes, to suit every project whether large or small, commercial, domestic or DIY. Our trucks will park as close as possible to the delivery area and, if the terrains allows, we offer a free barrowing service to place the concrete exactly where you need it, when you need it. If you have any questions about our ability to access your property, contact us and we can discuss the necessary requirements for our driver to comfortably navigate the mobile concrete vehicle on site. 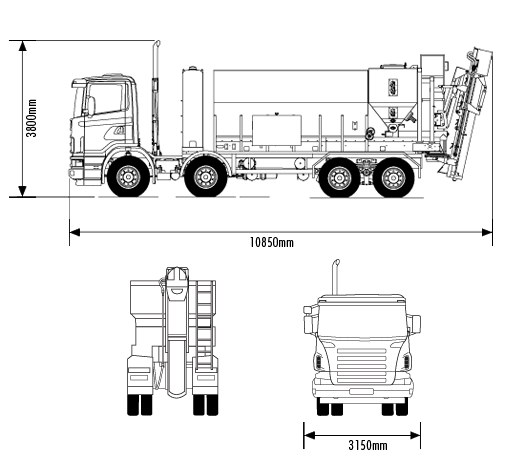 The dimensions of our truck are detailed below for your information.